Latest News > A night out under the stars at East Fortune. A night out under the stars at East Fortune. 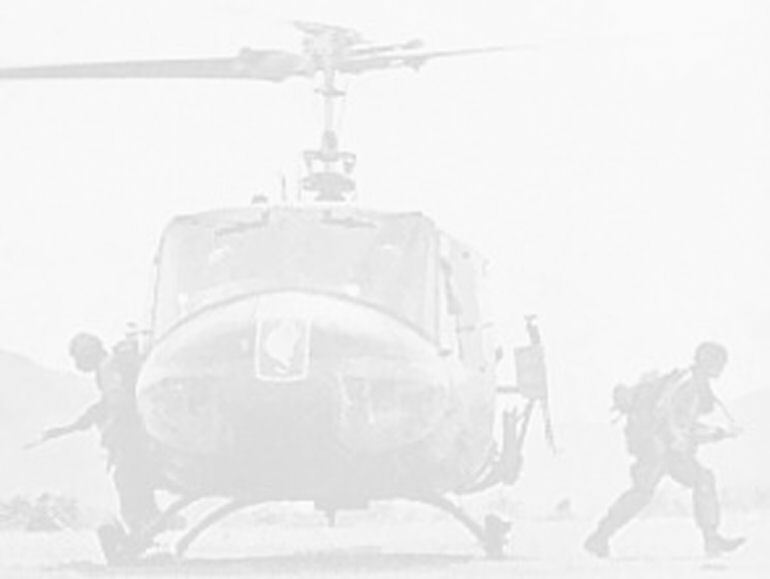 Huey 509 and Loach 011 left Wesham in the mid afternoon on Friday 25th July 2014 for the pair’s transit to Carlisle for refuelling using the callsign ‘Vietnam pair’. Our Ground support uniquely coloured cammo RV set off at Noon from Wesham for the drive north to meet us on site when we arrived. We transited at 1500ft AGL in loose pair formation routing via Garstang, Forton, Kendal, and Carlisle. Our first leg transit took 45 minutes to reach Carlisle where we were received with their usual excellent hospitality. After Jet A-1 refuels to both machines, we took off at 16:15hrs with an arrival time at East Fortune of 17:05. Needless to say, we were spot on time arriving at the site. The ‘RV’ was on site to welcome us into the Museum site. 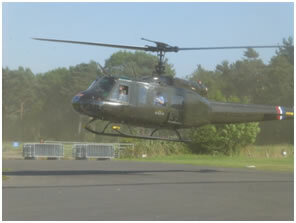 Both Huey and Loach were parked over in the Museum’s grounds for security overnight and we, the crew, slept close by. 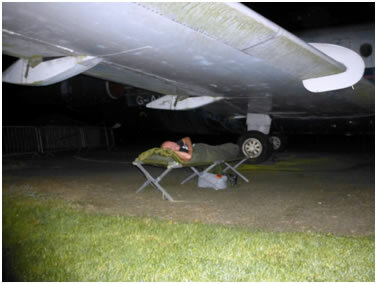 It was such good weather I camped under the Museums resident BAC 1-11 wing in my US Army Camp Cot and US issue Sleeping bag. Next morning we awoke to mist and arriving traders with their tentage. 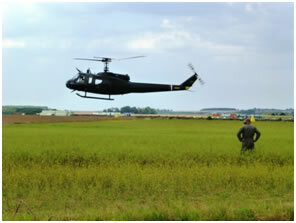 I repositioned the Huey over the airfield/museum fence at 07:55, waking up most of East Fortune with the unique sound the Huey makes, onto the flight line for the flying display later in the day. 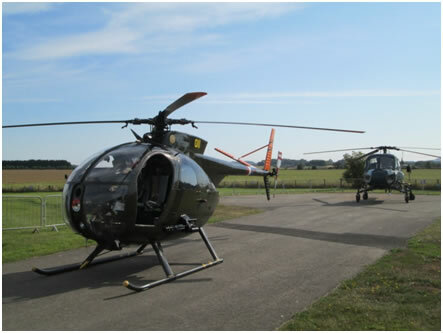 The Loach remained in the Museum’s grounds next to the superb Wasp Helicopter which also flew into the site on Friday as a fenced off static display. The Loach and the Wasp along with an Autogyro and the Lytham Spitfire were the ‘aircraft static display’ with the addition of traders and cadet’s aircraft mock up exhibits along with a RAFA Red Arrows Hawk. There was a large and very impressive re-enactment contingent on site too. 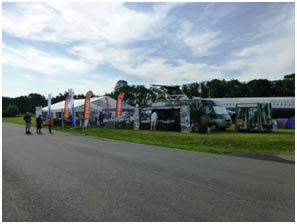 Our ground crew had a very busy day meeting up with all the visitors to both the mobile shop and the Loach static display. 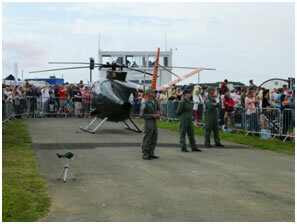 Many of the visitors bought Huey or Loach souvenirs as reminders of a special day and the crew alongside the Loach static display were kept busy all day discussing the unique stories of our Huey 509 and Loach 011. 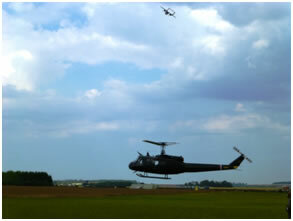 I had an 8 minute Huey display slot with the addition at the end of hovering in front of the crowd before repositioning clear of the display area to allow a unique photo opportunity as the superb Bronco did a fly past with the Huey hovering in the foreground! What a shot I’m sure. 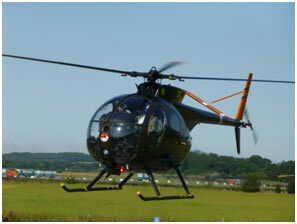 Please would folks out there be so kind as to send some photos onto us here on the Huey website so we can share them with all and sundry? After the display was closed by the magnificent Typhoon Display, Huey 509 departed for Edinburgh Airport for refuel and loach 11 set off south directly back to Wesham. In summary, THANK YOU East Fortune for a splendid time and we at the Huey team were impressed with the way you had it all set up. For those of you out there who have not been to East Fortune before, it’s a splendid Museum and I thoroughly recommend a visit.